Airspace is getting tighter as more people and goods take to the skies to reach their destinations. Global passenger traffic, expressed in Revenue Passenger Kilometers (RPK), is projected to increase 4.6 percent annually by 2032, reaching 12.4 trillion. This is the result of improvements in standards of living, lower oil prices and cheaper tickets. 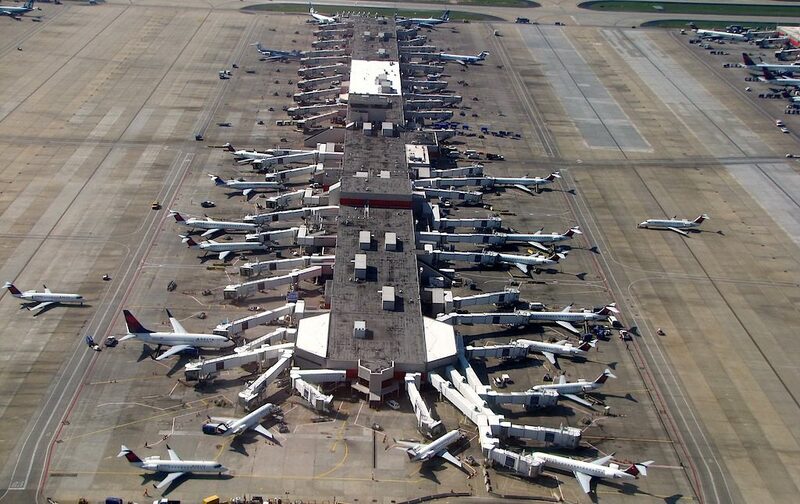 To meet the growing demand, airports all over the world are increasing their capacity. The Asia Pacific region’s Available Seat Kilometers (ASK) has increased 7.9 percent YoY, as China leads the way with numerous airport construction projects. Current and anticipated expenditure on airport infrastructure is USD 391 billion for the entire region. European airports experienced a 30 percent increase in passenger volume from 2012 to 2017. Currently, there are 450 airports facing a capacity crunch in Europe, and the region is currently expecting to spend USD 123 billion on airport infrastructure. North America saw a 4.9 percent YoY growth in its ASK and is currently and expected to spend about USD 123 billion in upgrading its existing airport infrastructure. There’s no set formula to deal with the growing capacity crunch, and airports in different regions are finding their own solutions from high tech to high-quality materials. Developing countries rich in land and capital, such as China, will deal with the growing number of passengers by building more airports. In other places such as North America, the focus will be on upgrading existing infrastructure and improving passenger flow with the help of technology. One example of software that is being applied to speed up the flyer’s journey and minimize errors is biometric technology. 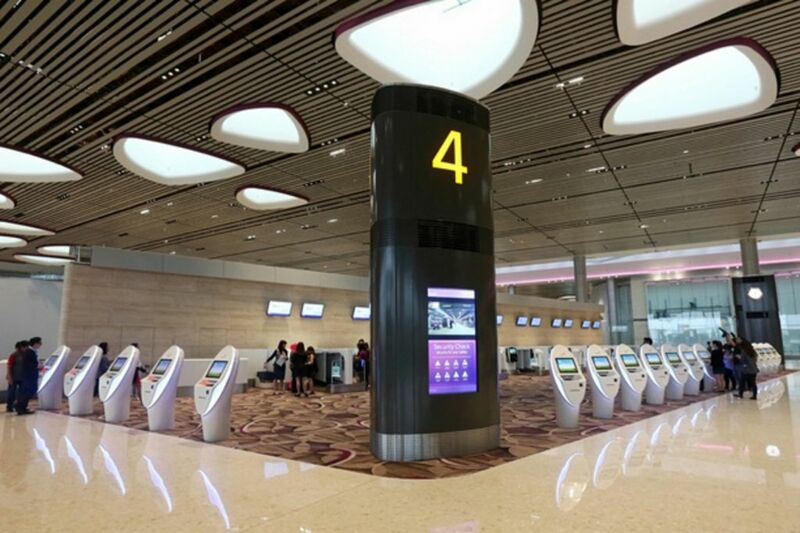 In Changi Airport Terminal 4, a system called Fast and Seamless Travel (FAST) with biometric technology and self-service features is already in place and will begin operations at the end of October. Passengers will be able to check-in, check baggage and board the plane, all through a series of self-service stops equipped with fingerprint scanners and facial recognition for identification instead of passports and boarding passes. Sydney Airport will also have a similar system running by the second half of 2018, and many major airports are looking to expand biometric technology applications to other areas such as flight information display systems and on-flight payments. This is great news for crowded airports. Besides bad weather, the biggest reason for delayed flights is delayed passenger information. As of now, airlines and airports do not share data regarding passengers. Even though airports are aware of passenger check-ins hours before departure, airlines are only notified at boarding gates. Thus, airlines are rushed last minute to verify passenger and flight crew information, causing delays. Reducing the redundant check-in process alone will speed up the flow of passengers through airports. In line with the trend toward self-service and passenger interactions with technology, airports and airlines are implementing AI and robotics to improve the passenger flight experience and make it more personalized. 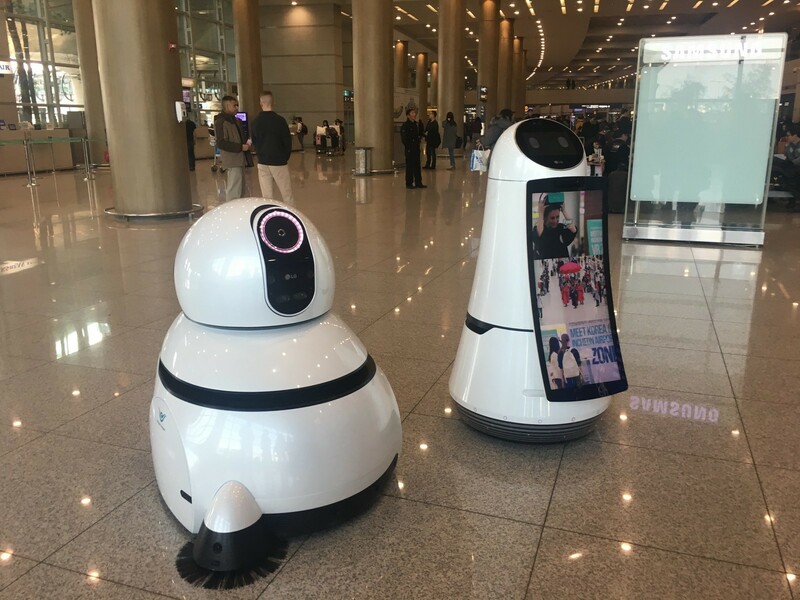 Last year, Incheon International Airport (ICN) in Korea added LG’s robots to its service team – the Airport Guide Robot and the Airport Cleaning Robot. The Guide Robot roams the terminals, ready to help out a passenger in need with airport and flight information in English, Korean, Chinese and Japanese. The bot even personally escorts travelers to the right terminal or boarding gate when passengers scan their boarding passes. The Cleaning Robot cleans nonstop, and can even detect dirty areas, analyze cleaning patterns and calculate the most efficient cleaning routes. Haneda Airport in Japan is also testing 7 different types of robots equipped with AI software to cover security, translation and baggage transportation. Investment in robotics is crucial for a country like Japan where there is a severe labor shortage due to low birth rates, and the airport is planning to have their bots up and running by 2020, in time for the Olympic Games in Tokyo. Passengers will also be greeted by a robot named Josie Pepper at Munich Airport’s Terminal 2. Josie Pepper functions on IBM Watson’s IoT and AI technologies. Her high-performance processor with a WLAN internet access connects to a cloud service that is also linked to airport data to deliver information to passengers in real-time. Moreover, machine learning allows Josie Petter to collect and analyze data and improve her responses over time instead of repeating inputted text. The use of technology will greatly improve the passenger flow through airports and increase passenger capacity. However, the new software systems will work best when accompanied by upgraded airport infrastructure. That’s why airports all over the world are undergoing expansion projects including Heathrow Airport (USD 17.3 billion), Sharjah International Airport (USD 400 million) and Auckland Airport (USD 160-180 million). ICN recently finished and opened its new Passenger Terminal 2, expanding the airport’s capacity to 72 million passengers and 5.8Mt of cargo every year. 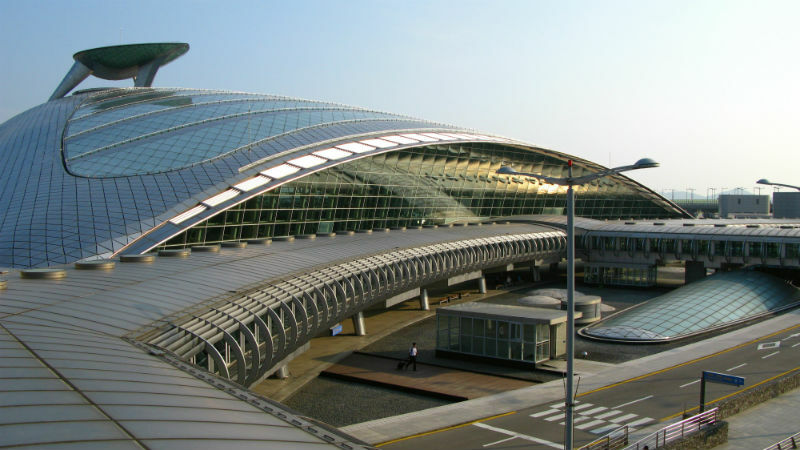 The terminal was built using 380 tons of POSCO’s 446M stainless steel that contains high amounts of chromium (26%) and molybdenum (2%) for maximum corrosion resistance against the airport’s coastal climate. Moreover, an innovative Bead Blast process was used to process the stainless steel to create a rough texture to decrease sunlight reflectivity for aircraft pilots during take-offs and landings. As with ICN, ongoing and future airport expansion projects are projected to consume vast amounts of high-quality steel that is superior in strength, corrosion-resistant and boosts the safety of passengers and flight crew. The renovated infrastructure will further be enhanced by new software upgrades, and future airports will be vastly more efficient and passenger-friendly. Cover photo courtesy of Dubai Airports.